A couple years ago...I started a quest. You see, as I'm ambitious, and determined (and stupid), I decided I'd try to complete every Stadium Club set in existence. After realizing how difficult it would be to complete some of the later ones (post 1996), I didn't put a ton of pressure on it. Since then, I've broken boxes of all three 1994 Stadium Club sets, and all three 1993 Stadium Club sets. So...the only natural direction to go is backward, to knock out '92. 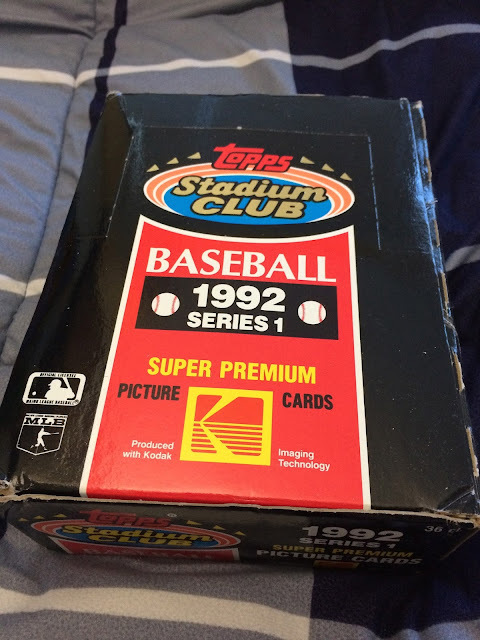 This box is from February, and I haven't had much progress on the '92 set since (though I might use this summer to work on that), but the collation here was good enough to knock out around 98% of the base set. I figure, since it's Memorial Day, and since I haven't broken a box on the blog in a while, that I should throw this one out. This was back in the early days of the set, coming off the landmark '91 set. The photography, by the way, is JUST getting good. 36 packs. I'm going to do, as per usual, 12 packs per post. As this is 1990's collation, we might zip through this mofo pretty quickly. Also, like with most Stadium Club rips, I'll be counting the cards I need, as well as the dupes (and inserts, if any). Ah, it's so wonderful at Pack 1- it feels like the box is your oyster. SC back in '92 catered both the posed AND action shot variety. The design here is WAY more minimalistic than the '91 set. It just takes up the right or left hand corner, leaving the entire rest of the card un-impeded by the design. It's probably the least invasive card design ever released, save for the 70's SSPC or whatever. Not a ton of star power in this pack, but the action shots are definitely more impressive than 92T flagship. Our one star card- Brett Butler was to LA what Paul Konerko was to Chicago. Closely zoomed posed shots. Yeah, SC had a ways to go before they got to do silly things with posed shots (like ALL OF THE '96 SET). A very young Steve Finley, and Gene Larkin taking some BP. Three star cards. Grace would have been a better player if he had stuck around for another half-decade. Heck, him and Belle are both guys who were amazing in the 1990's, and STOPPED being amazing the second the 90's ended. Molly...he's a pretty universally amazing player. I hope he can bring the Twins back from the edge. Kevin Brown, another member of the 'no, NOT THAT guy, but that is my name' club. Meanwhile, Mike Simms looks either enraged or confused. Or both. Both sides of Chicago get their backstop in this pack. Karkovice JUST got the gig, and would hold it for most of the decade. Girardi would bob between Denver and the Bronx over the next few years. Two big hitting 90's stars in uniforms I don't always picture them in. Terry Mulholland threw a no-hitter for my team. Manny Lee's pulling a double play, and Rance Mulliniks is taking some fielding warmups. My fourth straight 90's Twins star, Kent Hrbek, along with Cardinals legend Ray Lankford. Three heavy hitters- Hendu didn't get the memo which way Ryno and Tettleton were swinging. Scioscia, pre-defecting to the other side of LA, fields behind the backstop. McRae shows off those awesome baby blue Royals duds. Some nice field work from Robbie Alomar, a guy I forgot was so amazing at 2nd until that mammoth Hall of Fame turnout. Pags is just there to make him look good, and because I keep pulling Twins. JUST LOOK AT THAT. That's the right kind of hysterical. It looks like one of Uncle Rico's Glamour Shots from Napoleon Dynamite. The head tilt makes it even funnier. Somehow, Briley out-awkwards him. Thorzul has waxed poetic on the legend of Greg Briley, so I won't do much more than throw you his way. Some team legends. Baerga's is actually a pretty damn cool shot. Samuel, right after ditching my beloved Phillies, surfing the base paths. MacFarlane just looks perturbed. Two great, long tenured guys that are great players, but I doubt either one will ever make it to Cooperstown. A very nice slide shot with Treadways, and a rare pre-Brewers shot of Ricky Bones, one of the most 90's people you could possibly bring up. Not a ton going on in this pack, so our star cards are Rob Deer, and a very relaxed looking future Yankee Danny Tartabull. A very young Jeff Blauser looks at the golden swing of Cal Ripken Jr. Tears fill his eyes. It's impossible not to respect Jim Abbott. Guy pitched a no-hitter with one hand. Phenomenal talent. Glenn Braggs and that long-legged stride. Also, Kirt Manwaring, who can't NOT make an awesome baseball card, has a great in-action point. Robby V's doing some serious magic in Chicago this season. Also, Morris follows the swing. Devo's just looks awesome, badass and cool entirely. Van Slyke's has so many elements that it's beautiful. Capturing the slide at the exact right moment. Boever looks way too serious, but that vintage hat is WAY cool. Gardner has the right amount of focus. Fryman's rocking those late 80's Tigers uniforms. Pretty simple, but still a great shot because it shows all of O'Brien, even if it's culminating in a dropped ball. E-Mart's one of the greatest pure hitters of the last 25 years. And even if Buhner wasn't top-to-bottom brilliant, he still had some fantastic seasons in the 90's. Biggio's a Hall of Famer, and a well-deserved one at that. Krukkie, seen here running in the least subtle way possible, is a loudmouth, but we apparently love him in Philly. Lee Smith deserves a ton more respect than he's gotten. LaValliere's is a great catching shot, in action. Orton's just waiting for his call. Might be a while judging by his expression. McDowell, Barfield, Coleman. Man, none of these aged particularly well. Carney, in BP duds, fields some grounders for one of his last few seasons. I don't know who Kip Gross is, but he looks damn focused. Deion's even goofing around while making an outfield attempt. David Cone at that plate. Yeah, that's pretty awesome. Larry Walker backs away from a lead, which is even more awesome in a landscape. I'll get around to the next few packs when I can. There's some definite charm in here, that's for sure. So, at this point we can all kind of agree that the rebuilding offseason the Padres had in 2014 hasn't really amounted to anything. The young guys they got to supplement the team are either injured or...not doing what they were signed for. The team's not winning games, and is in even worse shape than before the reinforcements came in. At least they have Matt Kemp to keep hitting until he's sore. Aside from Kemp, this is a pretty paltry roster, because everybody's either new, injured, or slumping. Jemile Weeks and Brett Wallace are starters. BJ..oh, excuse me, MELVIN Upton has the best hitting WAR on the team. Drew Pomeranz and James Shields are pitching well enough, but, for obvious reasons, are lacking in the category. Meanwhile, Matt Kemp has 12 home runs and has picked up where his 2nd half left off last year. He's hitting so well that they're probably going to trade him before he can STOP hitting well. It's not like the Dodgers are exactly ailing in his absence- the outfield is flourishing, with Pederson, Puig and Ethier being themselves. So, at least he's somewhere where he's needed....DESPERATELY NEEDED. Without Kemp, there'd barely be any run support in San Diego. The second he leaves, either Wil Myers steps up, or they all just fall into fetal position hoping the first round draft pick can belt 40 a year. 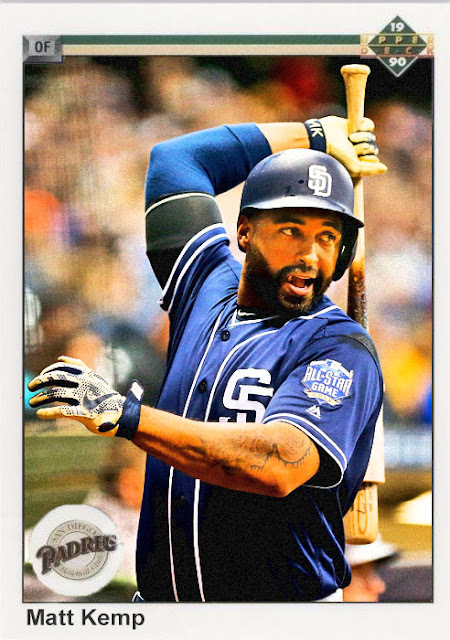 Still, kudos to Matt Kemp for staying much more relevant than I thought he'd be when he joined the Padres. Coming Tomorrow- The speedy, lethal-batting shortstop for an AL East team. Sadly, this time I'm talking about the Red Sox. March 2008. I believe it was Eastertime. I'm over my grandmother's house, and me and my dad, while waiting for my mom's dish of lasagna to bake, were watching, what else, Spring Training. Cardinals game, because that was what was on, and I hadn't developed my hatred for them yet. We're watching, and this kid, Colby Rasmus gets up. My dad knew of my growing love of baseball, so he looked at Rasmus and pointed. "That's Colby Rasmus. He's one of the top prospects for the Cardinals. He's gonna be huge someday." I heard him. So I remembered the name. 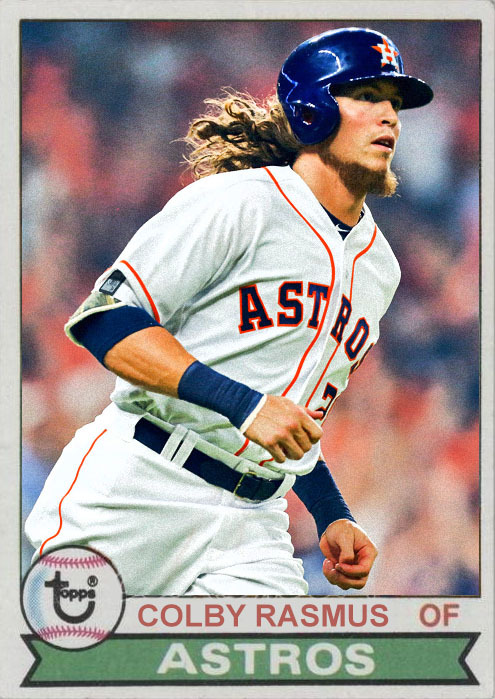 Unlike people like Andrew McCutchen or Austin Jackson, Colby Rasmus didn't exactly go for the HUGEST seasons. But he still went for good seasons. His tenure in Toronto was much-maligned, as he went and got cornrows halfway through one season, which was...kind of stupid. Once he got to the Astros he rebounded, first as a bench player, and eventually as one of the more reliable outfielders on the team. And now, Colby Rasmus is one of the few Houston Astros who's doing his job well. Yes, the team isn't in last anymore, but they're a far cry from first, thanks, mostly, in part to the freezing up of the pitching staff, and the lack of offensive progress from Carlos Gomez, Evan Gattis and Luis Valbuena. Springer and Altuve are there, but not as 'there' as they were last year. They're not the team they were in 2015, and it's become very clear. The West is a tough division this year- the Rangers are completely rebuilt, and the Mariners are having a pretty consistent season too. So unless Rasmus and the Astros want to stay in last, they need to figure out how to get past those teams, or how to succeed down the stretch. Because they've had last place seasons before, and it'd be pretty unfortunate to have one only a year after the big comeback, and two years after the last drought. The Astros are better than this...hopefully. Coming Tonight- Most of the Padres have been offensively challenged this year...save for one. Yes, I know, the Cubs are everything, the Cubs are the greatest, bla blah blah. But, for a moment, I think we need to talk about how the team in second is doing. Because while they may not be as absolutely AHEAD as the Cubs are, the Pirates are doing a ton right, and could be a sleeper hit later in the season. See, the Pirates have a great deal of what made them great the last few years. Yeah, Neil Walker and Pedro Alvarez are gone, but Andrew McCutchen is still there, and he's still one of the best players in baseball. 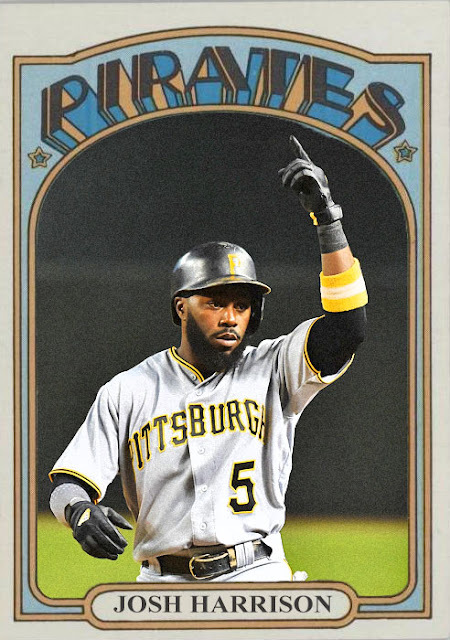 Josh Harrison, after a down 2015, is back to his usual tricks, hitting like hell and reclaiming his momentum. Starling Marte and Gregory Polanco are also still pretty formidable, and John Jaso has gone from a journeyman DH-C guy to the most unexpected hard-hitting first baseman in the NL this season. This one of those teams where even the bench is hitting pretty damn well. There is so much roster depth here, and Clint Hurdle has done his best to keep everything progressing. Heck, he's turned Juan Nicasio into a pretty impressive lower-half starter--the guy was as obscure as hell last year. The Pirates are a pretty compact team, one that doesn't need a ton of changes to be truly great in the second half. Their biggest obstacle is getting past the Cubs, the one thing they couldn't do last year, regardless of the head start. Coming Tomorrow- His team's been pretty awful this year, but he's been powerful as ever. Why Can't the Tigers Succeed? Is The World Ready for an 'Okay' Cardinals Team? Does Ryan Braun Still Matter?